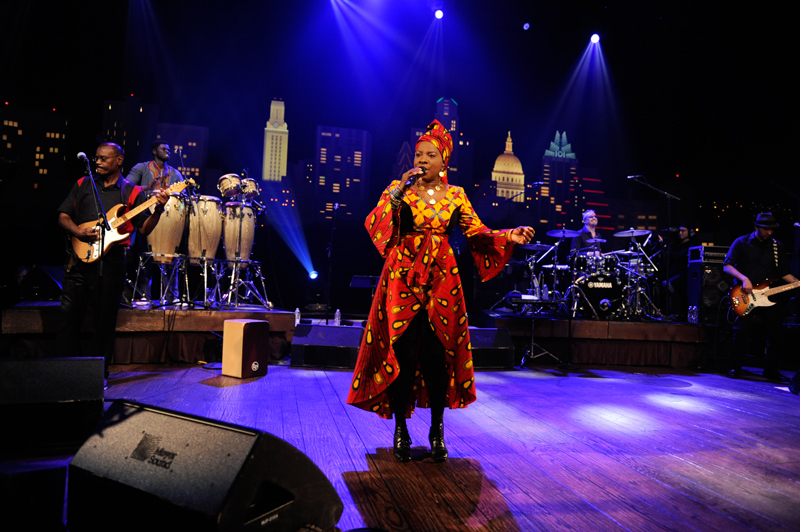 It’s been awhile since Austin City Limits has hosted an African artist. 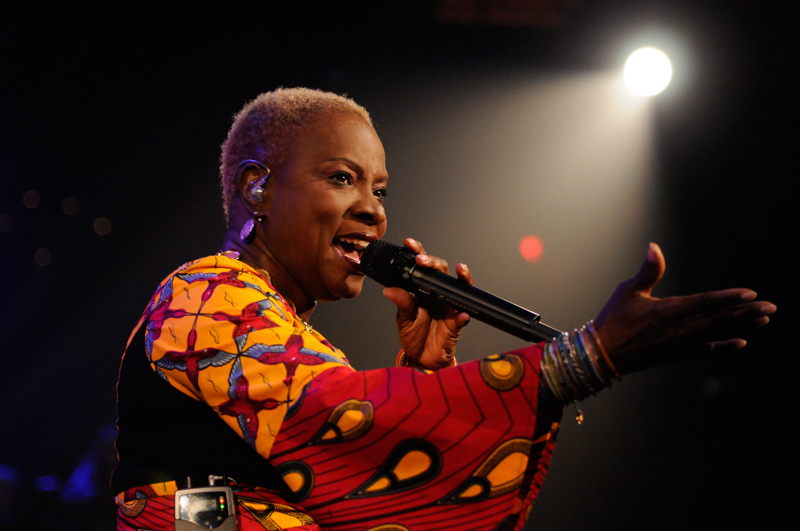 We’ve done memorable shows with Ladysmith Black Mambazo and Femi Kuti which have become some of our favorites, so we were ecstatic to welcome Grammy Award winning singer-songwriter Angélique Kidjo to our stage. 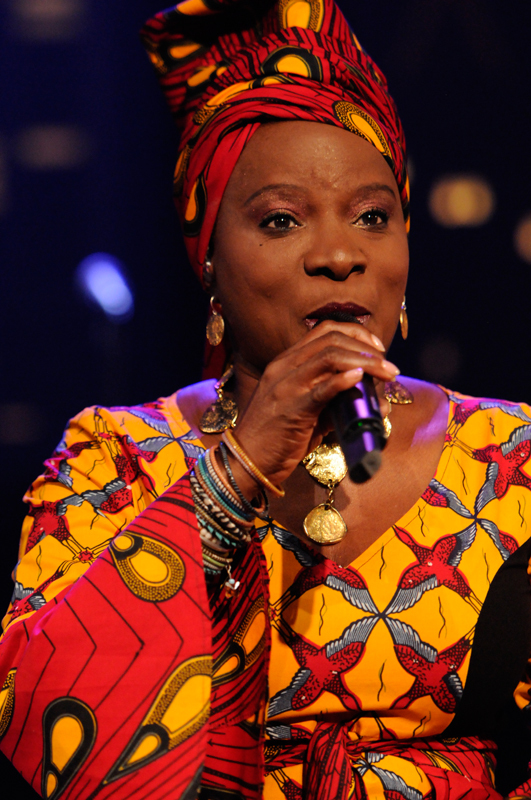 The queen of African music fulfilled our anticipation with one of the most energetic and danceable tapings in recent memory, which we livestreamed around the world. 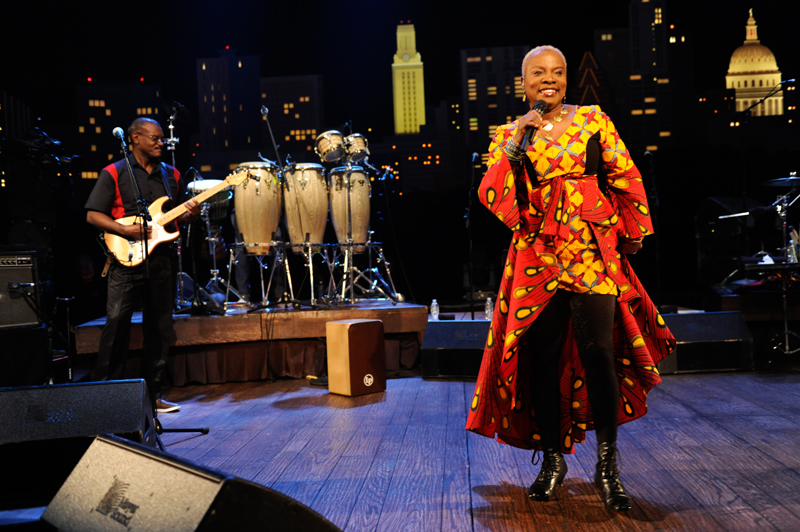 Kidjo’s four-piece band arrived first, clapping and cowbelling the beat of opener “Ebile,” immediately drawing the audience in by having them join in. 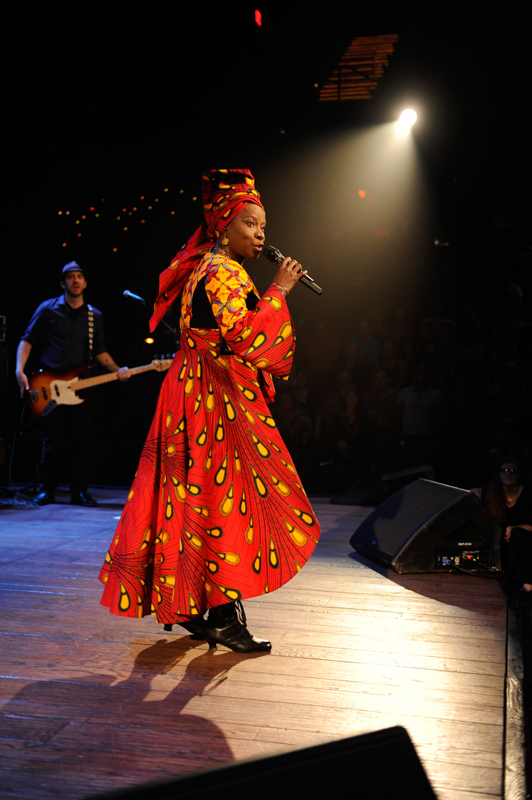 The Benin native herself took the stage resplendent in her colorful dress, letting her powerful voice soar over the percussion and her feet dance her around the stage. 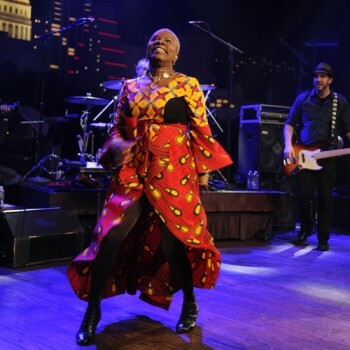 “I see you’re ready for singing and dancing,” Kidjo said, “so don’t hold back.” She herself certainly didn’t, as the feet-moving groove of “Kulumbu” galvanized band and crowd, enhanced by Dominic James’ fleet-fingered guitar solo. 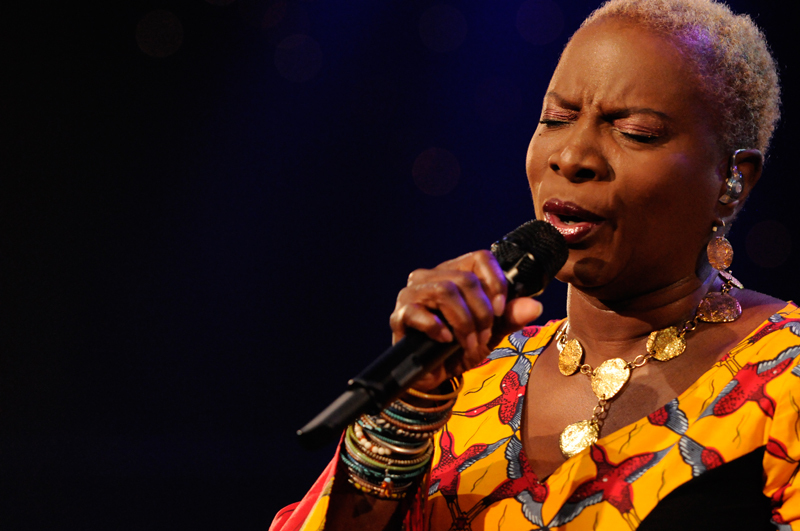 The jazzy “Batonga” kept the rhythm burning, incorporating call-and-response and more of Kidjo’s Terpsichorian grace. 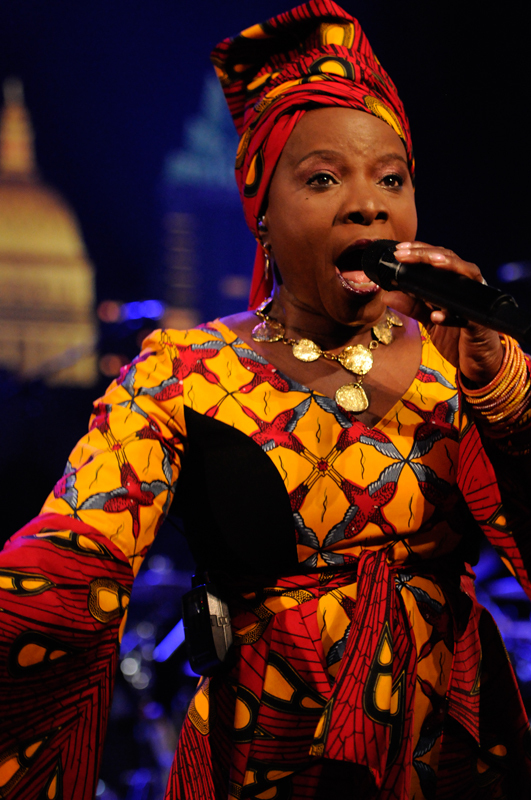 She paused to give the audience a quick singing lesson, so they could join in on the flowing “Senamou,” which ended with Kidjo’s imitation of a whirling dervish. 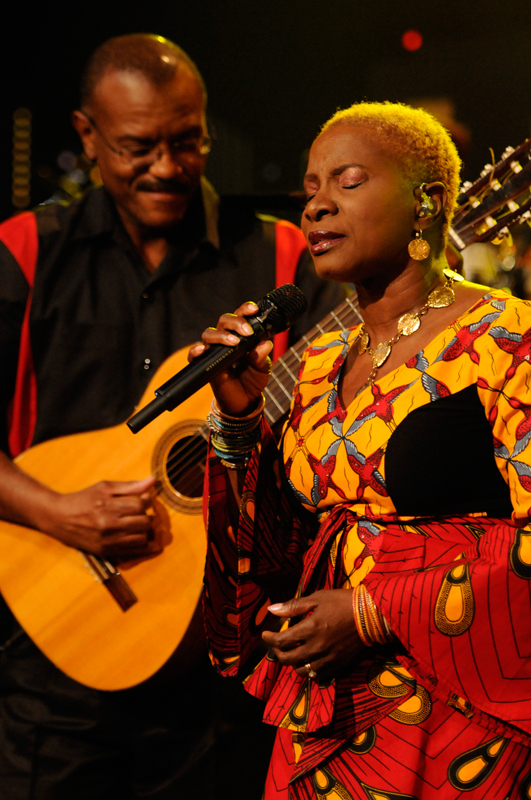 The beginning of “Malaika,” sung in Swahili, stripped things down to voice and acoustic guitar, before the rhythm section added a gently percolating groove. 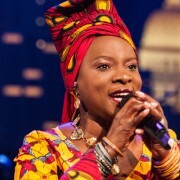 Kidjo then welcomed members of Austin choir Veritas, who added backing vocals to a soulful cover of Bob Marley’s “Redemption Song.” The choir remained for “Awalole,” a simmering and beautiful tune about women’s empowerment that ended with Kidjo playing a cajón. 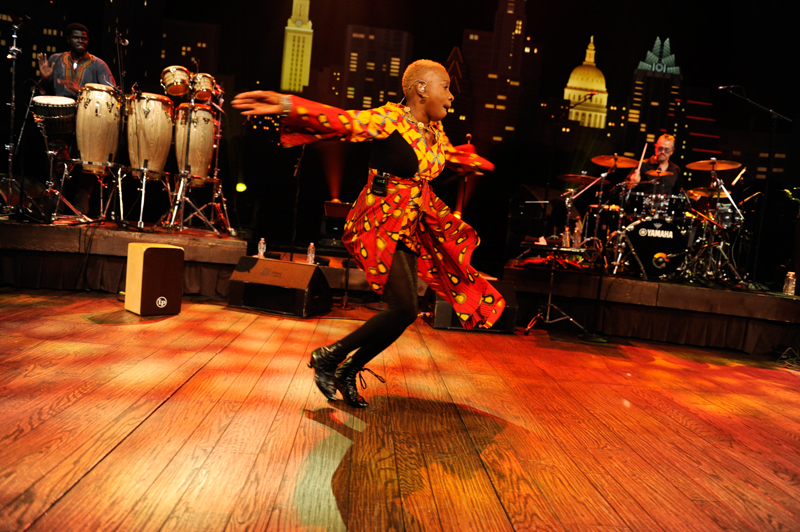 She stayed on the percussion box for the opening jam on “Shango Wa,” before retaking the microphone and kicking the song into extremely high gear. 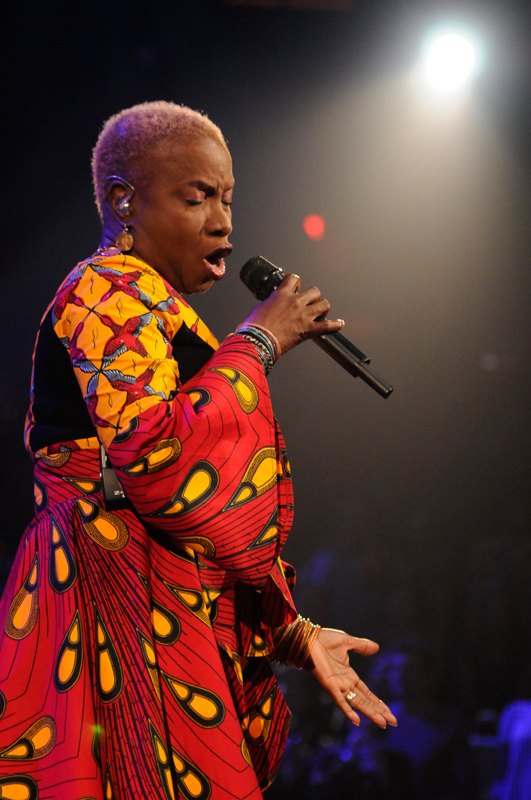 Things came down in energy, but not in intensity, as Kidjo’s passion for social justice came through in the near a cappella “Cauri,” a story of a 12-year-old girl being married against her will to a man in his fifties. 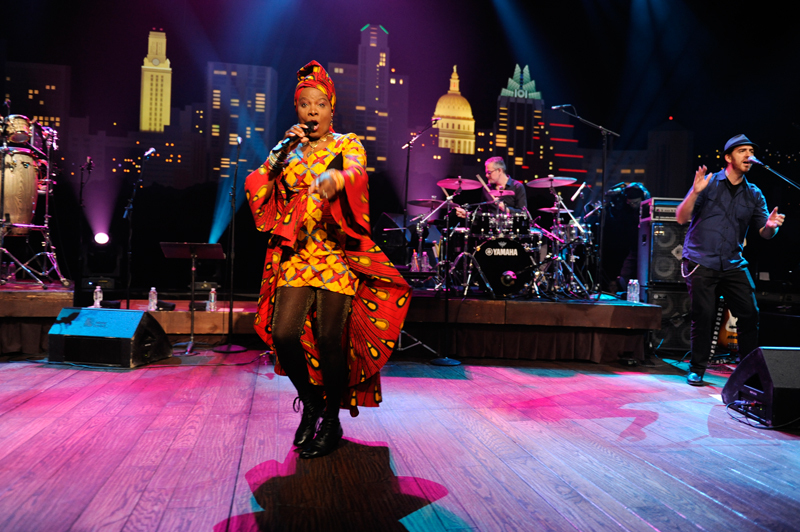 The mood turned defiant and celebratory, however, with the dance party “Bomba,” featuring a bit of choreography between Kidjo, James and bassist Ben Zwerin and more call-and-response with the eager audience. The Veritas Choir returned for the funky, infectious “Pata Pata,” a cover from the catalog of pioneering African singer Miriam Makeba with an unambiguous call to dance. The crowd, featuring members of the Austin Samba School, couldn’t resist, showering her with applause and cheers. 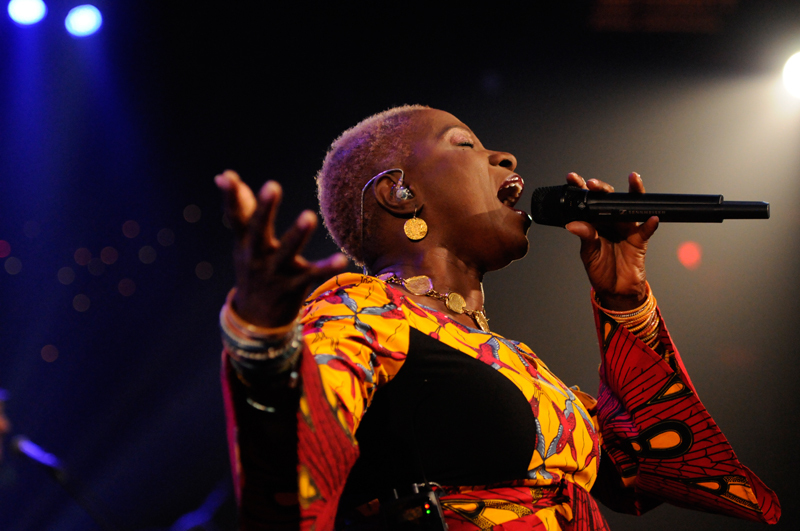 Kidjo followed that triumph with another: “Afirika,” a celebration of the human family, took her out into the audience to make that family sing and dance with abandon. The celebration continued when she invited the crowd onstage, as many of them as could fit following the lead of the Samba School and shaking their groove things to the luminous “Tumba.” Percussionist Magatte Sow brought his talking drum to the front for a conversation between his instrument, Kidjo and any dancer willing to join them. 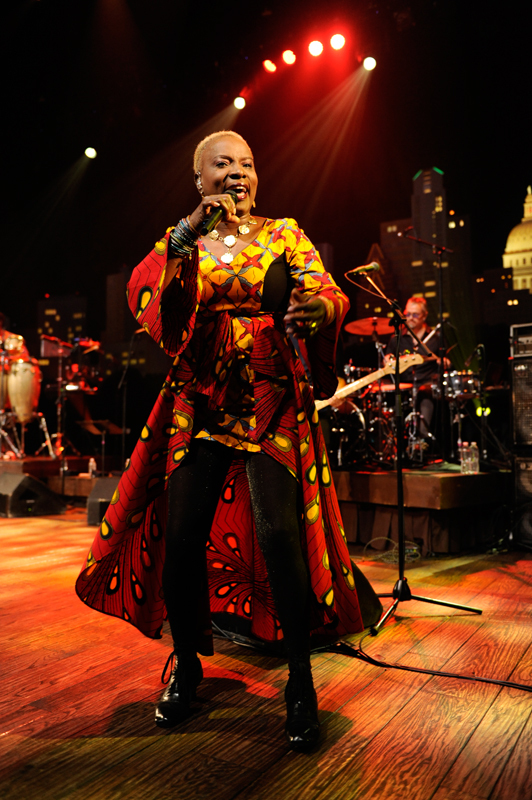 He also engaged in call-and-response between his drum and the audience’s claps, before turning the stage back over to Kidjo so she could lead the crowded stage in dance. 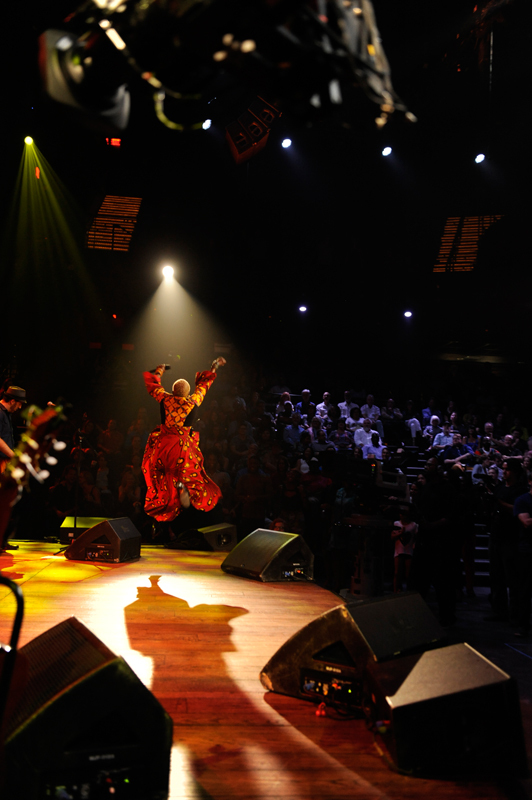 Kidjo left the stage to the people, the song ending in a joyous crescendo. Amazingly, it wasn’t over. 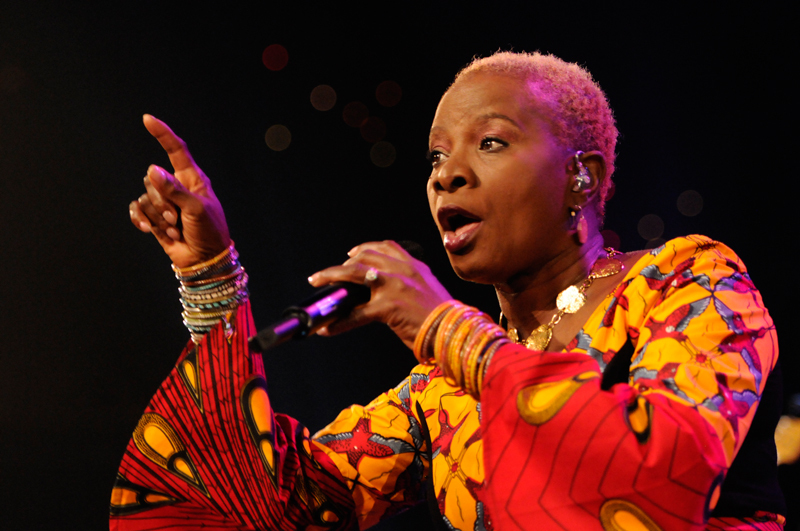 The stage cleared and Kidjo returned for a music lesson in the kind of African rhythm that’s influenced every musical form that’s come after it. 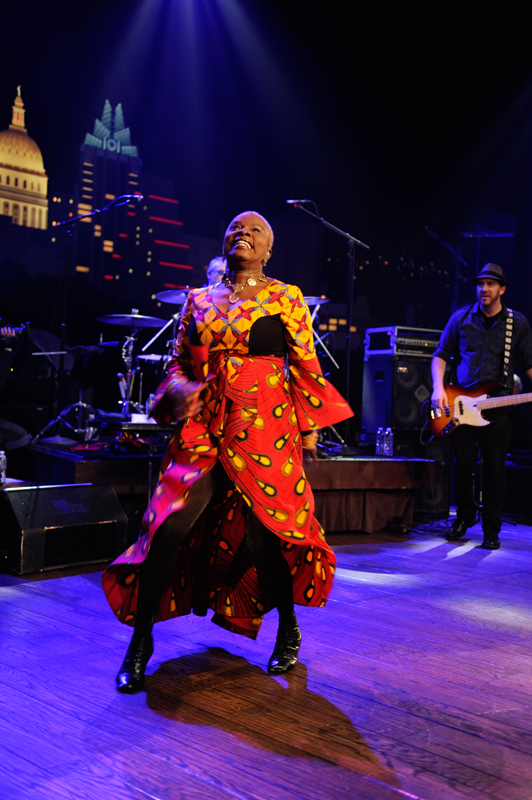 The stunning “Orisha” brought the crowd to its feet and its voice, bringing the show to an incredible close and earning Kidjo and her band a standing ovation. It was an amazing night, and we can’t wait for you to see it when it airs early next year on your local PBS station.